Daya Creates A New Word With Patients At Children's Hospital Colorado! Maya congratulated Daya on her nominations again this year for the Radio Disney Music Awards and asked what the coolest thing was about performing at the RDMA’s last year. Daya said, “My favorite part of last year was performing with Kelsea Ballerini. We clicked so well, we really meshed and it was so fun. Kelsea has such great energy.” Daya also reported that her favorite song to perform on tour is "Sit Still, Look Pretty." And, she loves it when the fans sing the lyrics back to her, because it is a really meaningful song to her. Patients and families always have goofy questions and like to have fun with all the celebrity visitors and Daya’s visit was no exception. Jahren wanted to know what Daya would fill a swimming pool with if she didn’t use water. Without hesitation, Daya said, “Mashed potatoes. I live and breathe mashed potatoes.” Daya even told us that she likes them topped with anything even gummy bears, Reese’s, or chocolate chips – but we think she was kidding about those toppings. Daya willingly played Backwards Forwards, a fun game that is a studio regular here in Colorado and was the first studio guest to sing her Backwards Forwards attempt. She sang, “Sit Still, Look Pretty”, and on the backwards version she hit all the right notes, but ending up saying, “Sit Still, Look Stizzy.” Lyric asked Daya if she has a pet parrot what she would teach it to say, and with a smile and a laugh she said, “Sit Still, Look Stizzy.” Before signing tons of autographs and taking bunches of pictures with patients and families. Daya gave these words of encouragement, “Stay beautiful and keep dreaming. 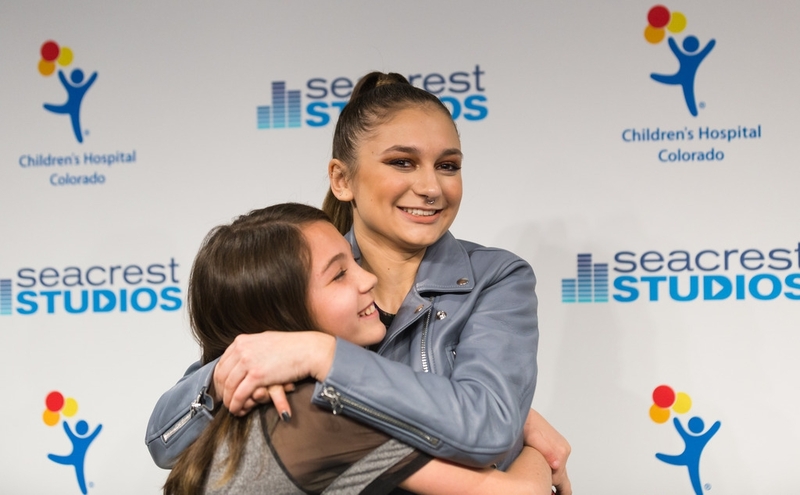 Be confident in your dreams and never for once think that you are not good enough.” Thanks for the encouragement Daya, here in Seacrest Studios, we will strive to always be Daya-dreamers!